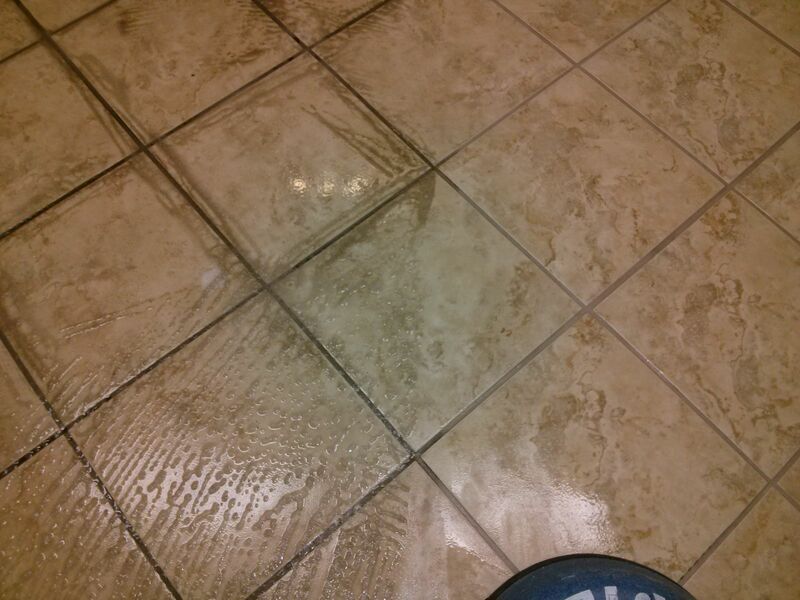 Here is a photo of a cleaning job Reliable did. This particular job was ceramic tile. You can see all the dirt being flushed out. Even with the right interim maintenance your floors will need a good proficient deep cleaning. On this tile and grout cleaning in Belleville, IL we pre-treated the tile and grout and then used some agitation on the grout lines. We then proceeded with an extremely hot water rinse. We use a special tool with two jets that rotate in a circle under a covered dome. The angle of the jets and the spinning motion takes out all the soil from the pores of the grout and rinses the tile clean. All of this dirty water is removed and contained under the dome. This prevents splatter and mess and leaves a vibrant clean floor. Look carefully at the edges of your floor or even in the corners. As long as filthy mop water has not been in contact with these areas time and time again they should be close to their original color that they once were. Tile floors add glamour to your home and are long-lasting. They do require professional maintenance from time to time just like everything else. With just a little care these floors will give you many years of service. What do you not want to do to your tile floors? Wax or similar products on ceramic and porcelain tile and grout floors should never be used. Those products are not right for these type of tile. They are definitely one of the most horrible things to do on your grout lines. These will leave you with a splotchy appearance that involves more work and makes it harder to remove. Another important tip is to not seal grout that is dirty. The adhesion of the sealer will not be as good and you will have created a barrier between any cleaning done and the dirt below. When your floors are needing professional cleaning leave it to the experts at Reliable Carpet, Upholstery, Tile & Grout Cleaning in Belleville, IL.